The life of a vulnerable child is filled with many unseen and unforseen challenges. A 9 year old Fareed might have to drop out of school to go work at the local market because his family needs him to work and feed his younger siblings. A 15 year old Shalini might be forced to quit school and stay at home because patriarchy raises its ugly head and prevents this girl from studying further. A 14 year old Shabnam is married off without her consent. A 8 year old Karthik is taken out of school because he is not doing too well at school anyway and he is better off cleaning dishes at the local canteen. A pair of siblings can become homeless because their parents passed away due to AIDS or an accident. A child might come home to find his mother has committed suicide after yet another episode of violence involving the father. Another child might have to forgo his sleeping spot under the bed and spend an entire monsoon huddled together with his 4 siblings, in one corner of their 7 ft x 7ft dwelling, because the roof is leaking. A child might have to survive on one meal a day without anyone knowing or make it through a life-threathening illness, solely on grace. These are just a few examples of the sort of everyday challenges faced by vulnerable children and this state of affairs exists in our society as if it were normal and completely acceptable. 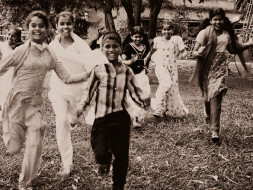 And these are the kind of children that Ahaan Foundation works with, with an intention to Nurture, Support and Empower. Our grassroots work involves holistic interventions covering education, life-skills, nutrition, mentoring and livelihood skills. Our goal is to ensure that a vulnerable child gets supported at various levels till he/she completes a professional education and becomes strong enough to step out of the circle of poverty. We are fundraising in order to keep up our intensive engagement with some of the most vulnerable children. Funds raised will mainly go towards funding our educational programs. We are aiming to strengthen our work with the children by starting up an 'After-school Children's Activity Center', by October this year. This center will ensure a more indepth interaction with the children on a day to day basis and will help us make effective use of volunteer support and to introduce new tools of learning. Some part of the funds will be used for capacity building in order to ensure that we can sustain our work over the long term. - While there is a lot of work being done for the benefit of children who are already in school, there is a need to give attention to the children who are falling through the cracks of the system. These are the children who need additional hand-holding and often one-on-one support over the long term. - Our holistic approach ensures that a vulnerable 4 year old is supported through the ups and downs of his/her challenges until he/she has learnt the professional skills and gained the emotional skills required to become a contributing member of society. - We are a small non-profit with big dreams and your support will help us spread our wings and take our work to the many children in need.